The Central Focus Retreat for Grace Brethren ministry leaders kicked off last evening at Maumee Bay State Park Resort and Conference Center near Toledo, Ohio. Located on the western shore of Lake Erie, the center has provided a place for the pastors from the central region of the U.S. and Canada to catch their breath. It is the first the retreat as been held at this site The theme for the two days away is “Breathe” and is based on Psalm 42:1. Sessions have been led by Dan Allan, pastor of the Grace Brethren Church in Ashland, Ohio. He has invited other pastors to join with him in presenting each session. Pastors have come from around Ohio, Indiana, Illinois, and Iowa to participate in the event, which concludes Wednesday, October 3. Last night (Monday), Bartley Sawatsky, pastor of Grace Community Church in Missassauga, Ontario, talked about worship, providing creative tips for renewing worship in one’s own life. “Worship is the spark plug for everything good for Christians. It’s the motivation for everything we do,” he said. This morning, Ronnie Martin, worship pastor at the Ashland, Ohio, Grace Brethren Church, spoke on conviction and confession, basing his thoughts in Psalm 32. “Conviction is when the Holy Spirit speaks to us, confession is when we speak to God,” he said. This afternoon, the men have free time to rest, relax, and fellowship. This evening, Joe Cosentino, pastor of the Grace Brethren Church in Canton, Ohio, leads the group with thoughts about thanksgiving. Tomorrow, Jeremy Wike, pastor of Community of Hope, a Grace brethren church in Columbia City, Ind., talks about supplication before the men head home. Photos from the event are available on the FGBC World page on Facebook. You may also follow @FGBCWorld on Twitter for a real-time report of the event. 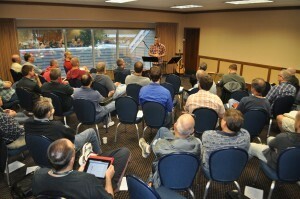 To track tweets from the retreat see the sidebar of this page or search for #centralfocus at twitter.com.